The New York Times began charging online readers Monday for full access to its website and dangled a heavily discounted introductory offer intended to lure its first digital subscribers. The Times is offering its three digital subscription plans for the same price of 99 cents for the first four weeks. After that, unlimited access to NYTimes.com and the newspaper's smartphone application will cost $15 for four weeks while full access to the website and a tablet computer application will cost $20 for four weeks. 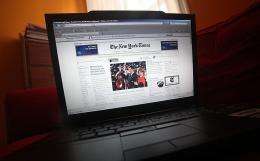 Full access to NYTimes.com and both smartphone and tablet applications will be $35 for four weeks. Times publisher Arthur Sulzberger, in a letter to readers on Monday, said the introduction of digital subscriptions is an "investment in our future." "It will allow us to develop new sources of revenue to strengthen our ability to continue our journalistic mission as well as undertake digital innovations that will enable us to provide you with high-quality journalism on whatever device you choose," Sulzberger said. The Times will offer readers 20 free articles a month at NYTimes.com before they will be asked to sign on to one of the three digital subscription plans. Home delivery subscribers to the print edition of The New York Times and the International Herald Tribune, a Paris-based Times co. newspaper, will have full and free access to NYTimes.com. Web users who find articles through links from blogs and social media like Facebook and Twitter will be able to read those articles even after reaching their monthly reading limit. The Times began testing its digital subscriptions in Canada on March 17 and extended the system to the rest of the world on Monday. Sulzberger said the Canadian launch "allowed us to test our systems and fine-tune the user interface and customer experience." Speaking last week at The Paley Center for Media in New York, the Times publisher said he is well aware that people will manage to find ways around paying for the newspaper online. "We did create something purposely porous," Sulzberger said. "Can people go around the system?" he asked. "The answer is yes. There are going to be ways. "Just as if you run down Sixth Avenue right now and you pass a newsstand and grab the paper and keep running you can actually get the Times free," he said. Like other US newspapers, the Times has been struggling with declining print advertising revenue, falling circulation and the migration of readers to free news online. Media analysts and publishers are divided over whether a paid strategy can work and the experience at the Times is expected to be closely watched by other newspapers looking to boost online revenue. Many US newspaper publishers have been reluctant to erect paywalls around their websites out of fear it will result in a loss of traffic and digital advertising revenue and they will be left out of the online conversation. In September 2007, The Times aborted a two-year experiment with making readers pay for full access to NYTimes.com called TimesSelect. The News Corp.-owned Wall Street Journal is currently the only major US newspaper charging readers for unlimited access to its website and other US publishers have been waiting for the Times to unveil its online plan. Times Co. shares lost 0.65 percent on Wall Street on Monday to close at $9.22.